Miniature Golf of Strasburg, PA! The Orange course is the more traditional of the two courses with a covered bridge, cave, and even a tobacco shed. The highly acclaimed Gold course provides a multitude of natural obstacles in a mature wooded setting. The existing hillside was intertwined with dramatic waterways to create a babbling backdrop for the spectacular landscaping which rivals any public gardens. We assure you that we are not a typical miniature golf course! 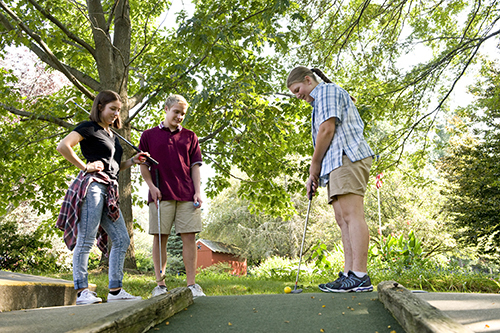 For the fifth consecutive year, the Village Greens has been voted the #1 miniature golf course in Lancaster County by readers of Lancaster County Magazine! Whether you just want to have fun with family and friends or practice your putting skills, our courses will provide you with the enjoyment and challenges you are seeking. 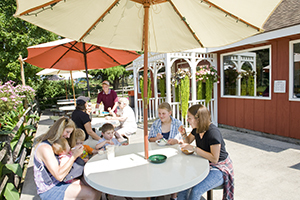 The Snack Bar with both air-conditioned seating and an outside patio provides the ultimate in a relaxed atmosphere. Old-fashioned milk shakes, hand dipped ice cream, soft drinks, assorted sandwiches and french fries are available to satisfy your appetite. Don’t Forget . . . Ask for your Village Greens punch ticket. Play 10 games and receive 1 game free! Receive our newsletter filled with money saving coupons and fun-filled tips. Your personal information is safe with us, and we will never share your email with anyone else. You may unsubscribe at any time with One Click. Just submit your e-mail address below to receive our newsletter!